Meet New York Times Bestselling author Master Zhi Gang Sha in San Francisco for complimentary Soul Healing Miracles Evening and spirituality workshop March 20 - 23. 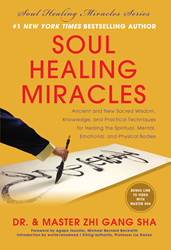 New York Times bestselling author and founder of Soul Mind Body Medicine®, Master Zhi Gang Sha, is a miracle soul healer. Focusing on Soul Power, Master Sha delivers soul wisdom to enlighten the soul, and soul healing for the spiritual, mental, emotional and physical bodies. After showcasing his acclaimed Chinese calligraphy scrolls in numerous cities around the world and attracting thousands of people, Master Sha returns to San Francisco by popular demand, with nine Source Ling Guang Calligraphy scrolls Featured in Master Sha’s newest national bestselling book, Soul Healing Miracles, the scrolls radiate the power of soul healing miracles to transform the lives of all visitors who connect with the scrolls. Master Sha offer the San Francisco community two extraordinary opportunities to experience the Source Chinese Calligraphy: Ling Guang Pu Zhao (Shining Soul Light) at a Soul Healing Evening on Thursday, March 20 from 7:00pm to 10:00pm PDT. Master Sha will then offer a profound and the life-transforming three-day workshop, Open Spiritual Channels, Friday – Sunday, March 21-23 from 10:00am -10:00pm for $150, plus three guest passes. Both the Soul Healing Miracles Evening and the Open Your Spiritual Channels Workshop are available live in-person at the Fort Mason Center, Fleet Room, located at 2 Marina Blvd in San Francisco, California, and via global webcast. During these extraordinary events, Master Sha will share powerful techniques to open spiritual channels so that people can advance on their physical and spiritual journeys. Plus, all registered attendees have the opportunity to invite three additional people to experience both events. To attend in San Francisco or via global webcast, visit: http://www.DrSha.com. Since Soul Healing Miracles’ publication, thousands of people worldwide have shared their personal soul healing miracles on video testimonials. View this extraordinary real-person video testimonial: Dr. and Master Sha Heals Woman’s Bulging Disc Pain After Twenty Years: http://www.youtube.com/watch?v=bF-8GMCwMZU. Millions of people are searching for wisdom to transform their health, find true love, advance their spiritual journey, and find financial balance -- all while seeking life’s purpose. Master Sha uses a very unique and rarely taught technique of creating each word with only a single, continuous brush stroke on each of the nine The Source Chinese Calligraphy scrolls featured in the Soul Healing Miracles book. Because Master Sha channels the Source, he transmits blessings instantly incorporating the teachings and wisdom onto these sacred scrolls. The Source Chinese Calligraphy scrolls create a healing field with the Source (frequency and vibration) power to transform all life, including boosting energy, stamina, vitality and immunity, as well as healing individuals’ spiritual, mental, emotional and physical bodies, thus preventing sickness, transforming relationships, opening the spiritual channels quickly and bringing success to every aspect of a person’s life. Each breathtaking Source Chinese Calligraphy scroll represents one of nine sacred phrases in Chinese transmitted from The Source through Master Sha into the calligraphy helping humanity to nourish the soul and promote soul healing among earth’s inhabitants. To Register for the Soul Healing Evening and the Open Spiritual Channels workshop with Master Zhi Gang Sha in-person or via webcast, or to locate one of Master Sha’s Worldwide Representatives in 22 cities, please go to http://www.DrSha.com or call Master Sha’s Soul Healing Center in San Francisco: 415.971.7373. Master Zhi Gang Sha is the world-renowned miracle soul healer. He has created thousands of soul healing miracles worldwide in the last ten years (http://www.youtube.com/zhigangsha). He is the founder of Soul Mind Body Medicine™®. He was trained as a conventional medical doctor in China and a doctor of traditional Chinese medicine in China and Canada. The founder of the Institute of Soul Healing and Enlightenment™ and the Love Peace Harmony Movement™, Master Sha is a grandmaster of many ancient disciplines, including tai chi, qigong, kung fu, feng shui, and the I Ching. Master Sha is also an expert in the most advanced cellular healing science now occurring in China. In the West, he is involved in breakthrough research on the effects of spirit on the human system. Dr. Sha was named Qigong Master of the Year at the Fifth World Congress on Qigong. In 2006, he was honored with the prestigious Martin Luther King, Jr. Commemorative Commission Award for his humanitarian efforts. Master Zhi Gang Sha has more than 100,000 followers on Facebook and an additional 250,000 devotees worldwide. The Soul Healing Miracles™ Chanting Channel fosters a soul healing community to learn and use chanting and soul songs for personal, spiritual, mental, and soul development, 24/7. Dr. and Master Sha’s Soul Healing Miracles™ Daily Live TV airs everyday on Livestream, 9am PT, 12pm ET. Master Sha’s national television show, The Divine Soul Song Series airs several times each week across the US, as well as worldwide on TelosTv.com’s digital network and http://www.DrSha.com. Everyday people all over the world are experiencing personal Soul Healing miracles and sharing their video testimonials so that others can benefit from these powerful and life-changing results on http://www.youtube.com/zhigangsha. Master Sha is author of ten books in the Soul Power Series published by Simon & Schuster (Atria Imprint), with each book reaching the New York Times bestselling list and four of them reaching #1. Master Sha’s new Soul Healing Miracles series is published by BenBella with the first book entitled Soul Healing Miracles: Ancient and New Sacred Wisdom, Knowledge, and Practical Techniques for Healing the Spiritual, Mental, Emotional, and Physical Bodies. Released in November 2013, it was an instant national bestseller landing on the USA Today, Wall Street Journal and Amazon bestseller lists within days of publication. I have the power to create soul healing miracles to transform all of my life. You have the power to create soul healing miracles to transform all of your life. and countless planets, stars, galaxies, and universes. All of Master Sha’s Soul Power Series books, DVDs, and CDs, reveal soul secrets, wisdom, knowledge, and practical techniques to transform every aspect of life, and are bestsellers throughout the world. Visit Master Sha on his website http://www.DrSha.com and http://www.facebook.com/DrandMasterSha to receive FREE daily Soul Healing blessings via webcasts, teleconferences, 24/7 Chanting Channel, and in-person at events held throughout the world.